Network landscapes are rapidly evolving, driven by trends in security, virtualization, cloud, SDN, NFV, IPv6 adoption, and the Internet of Things (IoT). These demands require advanced solutions for executing DNS, DHCP, and IP address management, critical network services collectively known as DDI. Infoblox DDI is our industry-leading, integrated, and centrally managed approach to delivering enterprise-grade DDI. It uses our patented Infoblox GridTM technology to ensure high availability DNS, DHCP, and IPAM services throughout your distributed network. Infoblox DDI makes it easier for you to achieve higher levels service uptime, security, and operational efficiencies across diverse infrastructure, including on-prem, cloud and hybrid deployments. To a large degree, your network is only as resilient as your DNS, because this system plays such a central role in connecting the devices and applications across your business. With Infoblox DNS, you can centrally manage and automate all aspects of DNS using a purpose-built platform to achieve the high availability, efficiency, security, and application response times you need to thrive in a digitally connected world. The proliferation of mobile devices and the advent of IPv6 are placing growing pressure on your organization to effectively provision and manage vast numbers of IP addresses, while overseeing DHCP activities more efficiently. 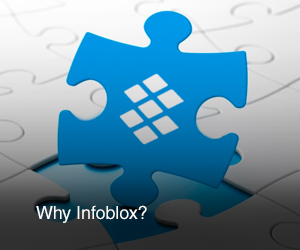 With the integrated Infoblox platform, you can handle your most challenging IPAM and DHCP requirements with ease. Infoblox is a trusted brand and industry leader with nearly 50% of the market share for DNS, DHCP, and IP address management (aka DDI) and growing.